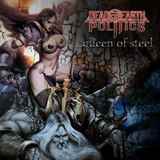 I have to admit that I was prejudiced by the cover art and the title of the EP, The Queen of Steel, from a Texas collective called Dead Earth Politics. Although the moniker of the band itself could have given away more modern metal style, just looking at that cover art and thinking of the EP title I was expecting a quick dose of old school proto-heavy metal, maybe something NWOBHM thrown in for good measure. So, given that Dead Earth Politics is none of that, the first pair of listens were spent coping with realization that I have to judge on the basis of what I am hearing, not on the deceiving basis of cover art expectations. I guess I should have paid attention to an earlier review of the band by one of my colleagues. When the opener Redneck Dragonslayer began in the style of a quick Gothenburgy thrashy piece that was welcome, but once a groovy bodyslam came on and an obligatory breakdown (with clean singing) followed, I can’t hide I was a bit disappointed. Yet with patience and more spins of The Queen of Steel I learned not to dismiss Dead Earth Politics based solely on the “modern metal” tag, as these are not a bunch of metalcore/mallcore groovers. Very American sounding, so to speak, and hailing from the team which Shadows Fall also call home to a degree, but with the certain amount of Entombed thrown into it, Dead Earth Politics put out well done songs, especially the EP title cut. On that song the band seems to squeeze a little more out of the truly thrashy moment, there is definitely a strong melody in the verse, followed by that trademark slamming bridge and riff-rich chorus. Almost power-metal sounding solos don’t hurt, clean vocals are not whiny and gruff voice is not ridiculous – I did enjoy the song, even though this is generally not my cup of tea. Jazzy and syncopated Madness of the Wanderer is heavy throughout and shows up Dead Earth Politics instrumental versatility. Even if groovy metal is something you swore away from, a quick foray into it with Dead Earth Politics should not hurt your ears or other senses.